I've reviewed Nestlé ice cream before, but those previous reviews were all of their US products, and, I didn't really like any. But now it is time to focus on their Canadian offerings, which, yes, are different. Over the summer, I visited our office in Waterloo, Canada, where they had one of my favorite perks: an ice cream freezer, filled with classic ice creams from the host country. You know how much I love my ice cream, and may recall my raving about Street's ice cream from Sydney, and both Heartbrand and Mövenpick in Zurich. So even though I knew that Nestlé's US offerings are pretty mediocre, I was still excited, and managed to try nearly every selection during my short time there. I enjoyed all three varieties I tried, and would gladly eat more of these, which is more than I can say for US based Nestlé products! King Size Cookie Dough Drumstick. "Creamy cookie dough and chocolate with a rich chocolate swirl topped with delicious cookie dough pieces all in a chocolatey lined sugar cone with a chocolatey tip!" I think this may be only available in Canada. +1 to Canada! I've been pretty down on Drumsticks in the past. The Canadian offerings didn't look much different from those in the US. I was ready to pass them by, and then I noticed one flavor: cookie dough. I was drawn in. It was a crazy hot day (yes! 90 degrees! They have real summer there!) and they had an outside deck adjacent to the ice cream freezer, so it seemed like a match made in heaven. And ... it was. This was really, truly enjoyable. This wasn't just a normal Drumstick, it was King Size, and expected that I'd eat the bits of cookie dough off the top, perhaps eat part of the "ice cream", and then move on. But, no. I kept going, and going, and going. And then it was gone. Why? Because it was really good! On top were the bits of cookie dough. Interestingly, I think they were just cookie dough, not chocolate chip cookie dough, as we've all come to expect when we hear "cookie dough". Sweet, slightly buttery tasting, good texture. Things were looking good. Also on top was some chocolate sauce. But the "ice cream" has always been the part of Drumsticks that has failed to impress me. This one had two flavors of ice cream (or frozen dairy product - I believe they can't call it ice cream because it doesn't meet the industry definition of ice cream? ), one was milk chocolate and the other was ... tan. I think it was "cookie dough" flavored? I was intrigued, in part because I've never actually had cookie dough flavor ice cream, rather than vanilla ice cream with cookie dough bits like were on top of the cone. 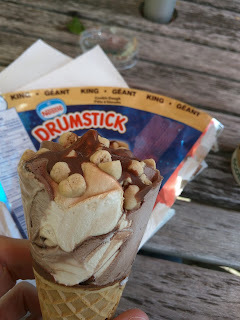 Both ice creams were creamier than I've ever countered before with a Drumstick. The temperature was about 90 degrees, and it melted just perfectly. Not so fast that I had a mess on my hands, but fast enough to make it perfectly lickable. Melty, creamy, soft, sweet ... ok, wow. I enjoyed eating the cookie dough topping off, and then I enjoyed licking my ice cream, over and over again. The King Size cones really have a lot of ice cream. Once I reached the cone layer, I intended to ditch it. I knew there wasn't that much ice cream left in the code anyway, I was pretty full (cuz uh, I also had a big slice of lemon meringue pie from the cafe literally moments before), and I never like the cones. But this cone wasn't bad. It wasn't soggy, it stayed crispy. I still don't love sugar cones, so I wasn't that into the cone, but there was something magic going on down in it. It was chocolate lined, like always. But also, inside the center of the ice cream in the cone, was a core of chocolate sauce. It made the ice cream even better. I cracked open the cone itself, and used it to scoop all the remaining ice cream and sauce out. So delicious. I was powerless, and devoured the rest on the spot. This was actually a winner, and I'd get another in a heartbeat. King Size Sweet 'n Salty Caramel Drumstick. "Creamy-tasting vanilla and salted caramel ripple, topped with praline-roasted peanuts." The next day, I rushed back for another Cookie Dough Drumstick. But, alas, they were all out. I settled for the Sweet 'n Salty Caramel instead. It was ... fine. Still better than other Drumsticks I've had in the past. I'm starting to wonder if the Canadian ones are actually different, or, if the warm weather just makes them more magical, as they melt so nicely? This one also had two types of ice cream swirled together, regular vanilla and sweet caramel. The caramel was too sweet for me. The vanilla was necessary to balance it, but, still just a touch too sweet overall. The ice cream however was creamy and again melted just perfectly. On top was a drizzle of additional runny caramel, again, more sweet. I never tasted any of the namesake "salty". There were also some bits of candied peanuts. I didn't like the peanuts very much, I'm not sure why, as I like candied nuts and I love peanuts, but these tasted just kinda bad. Definitely not nearly as successful of a topping as the cookie dough bites. Once I broke through the massive scoop on top (yeah King Size! 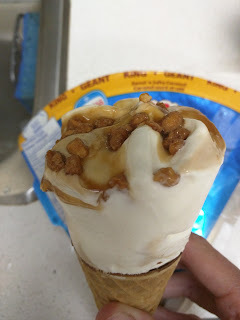 ), the ice cream below had additional caramel down the core. This was sweet too, but since it was the caramel sauce rather than the ice cream, it seemed to work better somehow, I wasn't quite as sweet overwhelmed. The cone, as always, was chocolate lined. I like the chocolate, and always eat the tip of the cone that is just a big chunk of chocolate, but I never like the actual sugar cone. Still, I always want it because I love licking ice cream from a cone, so, no real complains. This was fine, I finished it easily, but I don't want another. King Size Chocolate Fudge Brownie Drumstick. "Creamy texture with chewy brownie pieces in this King size cone that’ll make any chocolate lover go weak at the knees." My final day in the office, I eagerly headed to the ice cream freezer. I wanted another cookie dough Drumstick! But again, no dice. The King Size offering of the day was ... Chocolate Fudge Brownie. I'm not a huge chocolate ice cream fan, but I still settled for it. Turns out, it wasn't really settling. 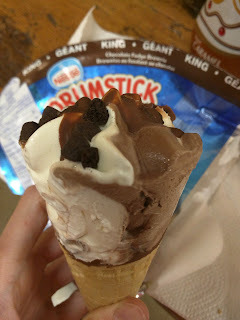 It followed the same formula as the previous two King Size Drumsticks: 2 types of ice cream swirled together (this time, vanilla and chocolate), sauce on top and in the ice cream core (chocolate sauce), and bits of a namesake goodie on top (fudge brownies). I'd seen all of these components before, except for the brownies of course. It was about the same as the others. Creamy ice cream that melted perfectly. I loved the addition of the chocolate sauce on top and down inside the ice cream in the cone. The brownie bits on top were similar to the cookie dough in both size and texture. Not too big, not too small, slightly sweet. Tasty enough. Overall, very enjoyable. I really do like the formula they have adopted here for two flavors of really nicely creamy ice cream, sweet sauce, and a fun topping. I'd get another, but really, I just want another cookie dough one! 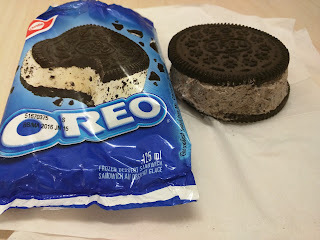 I also tried another Nestlé ice cream product: the Oreo Ice Cream Sandwich. The astute reader may notice that I have "Nestlé" and "Oreo" in the same sentence, and knows that Oreos are made by Nabisco, not Nestlé. This is certainly true. 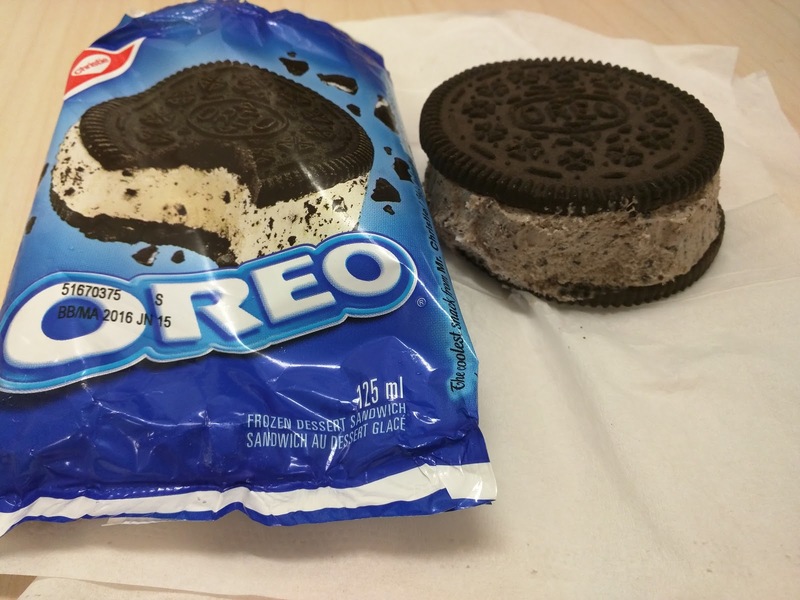 But, Nabisco doesn't make ice cream treats, so they license the name to several ice cream manufactures, including Breyers (for Oreo ice cream), Good Humor (for Oreo ice cream bars), and Klondike (for Oreo ice cream sandwiches) in the US, and, Nestlé in Canada, to make these ice cream sandwiches. Unfortunately, the cookie was ... soggy. It didn't actually remind me of an Oreo, even though it certainly looked like a jumbo sized one. The soggy texture was just far too different from a real Oreo. The ice cream inside wasn't creamy, and as you can see, it wasn't white like in the picture on the wrapper (not that I cared if it was white or not). It had lots of cookie bits throughout, but, otherwise, was unremarkable. But most significantly, it didn't taste like Oreo filling, and I desperately wanted it to. Everyone knows the good part of an Oreo is the creme filling, and this had none of the creme flavor, which, in addition to the soggy cookies, made it a fail for me. 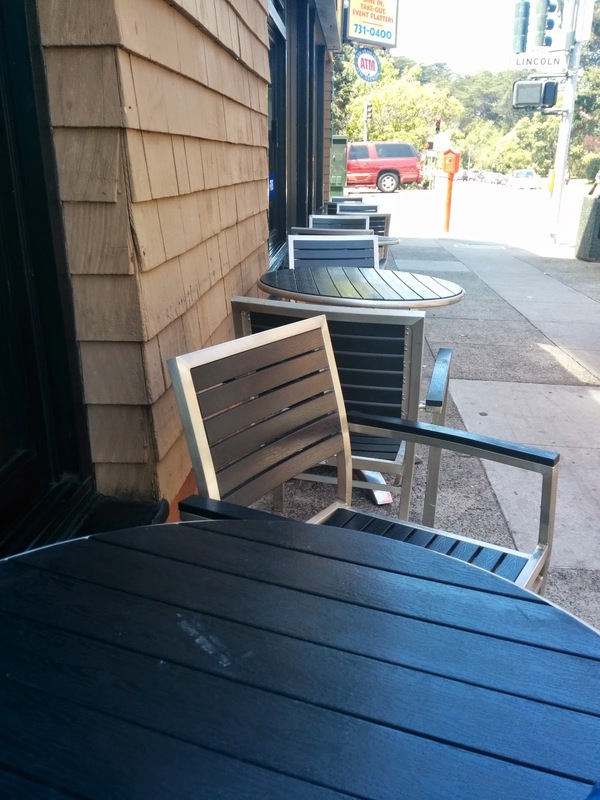 Park Gyros is a Mediterranean restaurant located near Golden Gate Park, featuring mostly Greek cuisine, but they describe themselves as "Ancient Greece Meets Contemporary Turkey". The menu has all the standard Mediterranean appetizers you'd expect (baba ghanoush, hummus, tabouleh, dolma, etc), plus tons of wraps (gyros, falafel, etc), assorted kebab plates with rice, salad, and pita, and a few traditional entrees like moussaka. But I'm not really a big fan of Mediterranean food, sans one category. You guessed it: dessert. The dessert menu is not extensive, with only two options, baklava or rice pudding. But who needs options, when you have rice pudding? I love pretty much all puddings, rice pudding included. And, spoiler, Park Gyros does a great rice pudding. So, Park Gyros. This is a casual place, you order at a register, located along a counter with the assorted dips and raw kebobs on display. There is seating inside and out, all clean and well taken care of. Service has been quite friendly on all my visits. Yes, I've gone multiple times, because the rice pudding is just that good. If you ever find yourself near Golden Gate Park, it is certainly worth checking out. As I said, I had my eyes only on dessert. Yelpers rave about the baklava, but, baklava is never really my thing. Sure, I like it, but baklava is like cookies to me, I like them, but I'd pick something else given the choice. But I do love puddings, and in particular rice pudding, even though I'm not much of a rice eater. When I saw the rice puddings behind the counter, there was no doubt in my mind that I was getting one. Of course, rice pudding comes in many styles. Is it served warm or cold? Does it have raisins? Or nuts? How much spicing? What kind of spices? Cardamon? Cinnamon on top? How sweet is it? 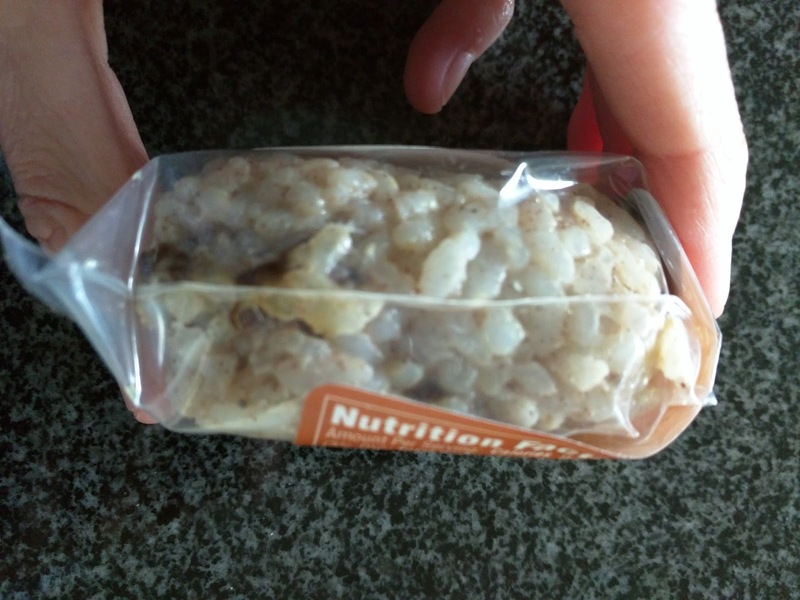 Is the rice short or long grained? Is the pudding runny or custardy? Topped with whipped cream? Or even fruit? Was it boiled on the stovetop, or baked? Unlike crème brûlée, where I have a very, very specific style I like, with rice pudding, I like it many different ways. But, I've had a lot of rice puddings over the years that were highly mediocre, like the one from Lahore Karahi, that even though it did have raisins, nuts, and spicing, was totally uninteresting. Or the far too sweet version from Amber Dhara. I had no idea what to expect from Park Gyros, as they are a gyro shop, not exactly specializing in desserts. It was a massive serving of rice pudding. What you see above is a single portion. Yes, it came in a little aluminum tray (apparently this is traditional, I just learned that now). As the cashier packaged it up, he asked if I'd like cinnamon on top. I said sure, and it was freshly sprinkled on for me. I'm curious why they don't always add it, do some people not like cinnamon? I certainly like cinnamon on my rice pudding. Anyway, I liked that touch, cinnamon'ed to order. The most common rice pudding I encounter is Indian kheer, and I knew this would be a bit different, namely because kheer is boiled on the stovetop, and Turkish rice pudding is baked. 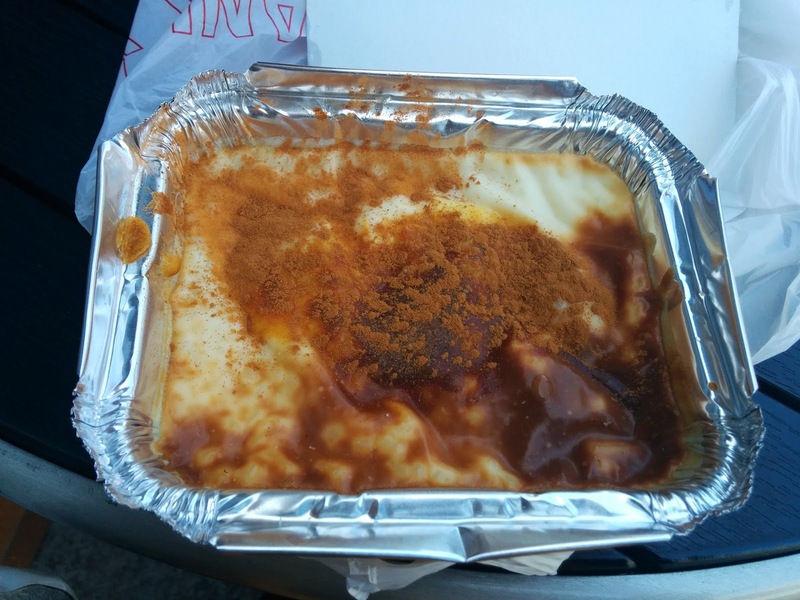 I remember the first time I had Turkish rice pudding, from Tuba, and was a bit put off by the film-like layer on top that results from baking, and the scorch marks on top, because I was unfamiliar with that style. This time, when I saw the film layer, I momentarily thought there was paper or something on top, but then quickly remembered my previous experience. I really liked this rice pudding. And this time, I even embraced that top film layer, appreciating it for the contrasting texture. The rice was short grained, not remarkable, not too mushy, not really al dente either, just there. There wasn't tons of rice, but the pudding was thick enough to stand alone. The pudding was sweetened, but not too sweet. The cinnamon added some nice spicing. I didn't really detect any other spices, and there were no nuts nor raisins either. Somehow, I know this doesn't sound that great, but it really did taste good. The sweetness was just right, the spicing was balanced, and it was perfectly creamy and comforting. I didn't need to add anything to it, and appreciated it for its simplicity. It reminded me of the pre-packaged one I had from Juan J's, which I had previously claimed beats out most restaurant rice puddings. The portion size that I originally thought was insanely large was easily finished. I sorta wished I'd gotten a second one to bring home and eat later. Or to have for breakfast the next day. It was quite good, and I'd gladly get another. The $3.50 price was fine for a large portion of a clearly homemade item. Update review: I was near Golden Gate park one afternoon and remembered the rice pudding, so I swung by Park Gyros again. This time, I was not asked if I wanted cinnamon added, and it was just dumped on. And yes, dumped. I think he slipped as he was doing it, as he really did add a rather large pile of cinnamon on top. Anyway, it was still delicious. I love how absolutely creamy the pudding is, how it is the right level of sweet (not too sweet, but sweet enough to feel like a dessert), and strangely I love the thick film on top. I'll continue to pick this up as a treat whenever I find myself in that part of town. 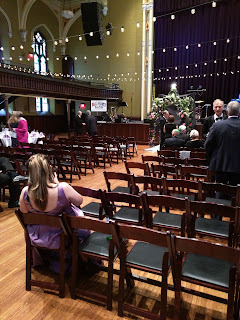 Over the summer, I attended a wedding held at Asbury Hall, in Buffalo, NY. It is a really fascinating venue, originally a Methodist church, constructed in the 1800s. It is listed on the National Register of Historic Places. And it is owned by Ani DeFranco. Random, yes. But a really great venue for a wedding, with a big stage in front, plentiful space in the hall, and even a balcony level. In the middle of they hall they set rows for the seated ceremony. They were quickly cleared away after dinner and turned into a dance floor. Dinner was a seated tables around the room. Anyway, this isn't "Julie's Architecture Review Club", so, I'll stop talking about the venue, and instead focus on what you are here for: the food! 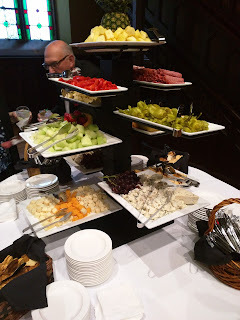 The catering was done by Exquisite Catering, and, assuming it would go the way of pretty much all wedding catering, aka, totally disappointing (like even at the famous Parker House), I didn't take notes, nor did I ever intend to write a review. But, the quality of the catering was so impressive, I am compelled to write this up. You know, just in case any of you need to throw a wedding in Buffalo, NY and are looking for a caterer. If you are, I highly, highly recommend Exquisite Catering! The summary? They used quality ingredients, the food was well prepared, and shockingly, even for catering, it was served hot, and the veggies were perfectly crisp. I was honestly stunned. 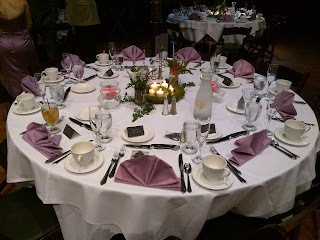 Our friends choose a wedding package featuring an open bar for four hours, a champagne toast, a cocktail hour with fruit, cheese, and antipasto displays plus three passed hot appetizers, and then a seated dinner with a salad and three entree options. I'll review both sections of the night. The evening started with a cocktail hour, which included both stationary cold appetizers and hot passed appetizers. The bar was well stocked, and the bartenders very friendly. Great service from the staff. Sopresetta and Capicola, Seasonal Fresh Fruit, Domestic Cheese, Imported Cheese, Crackers." All wedding packages include cheese and fruit at this station, and our hosts upgraded to include antipasto for $2/person. The cold apps were an array of antipasto, cheese, and fruit, arranged on platters spiraling around a center piece. The staff kept this area replenished nonstop. This was the weakest part of the meal though. I didn't try any of the fruit, didn't love the charcuterie, and thought the brie was flavorless, but I did really enjoy the smoked gouda. That said, I wasn't trying to fill up on these items, when there were far better things to come. Hot Apps: Duck Confit, Spanikopita, Spring Rolls. The apps were brought around by servers circulating the room throughout the cocktail hour. I didn't take any photos during that time, again, not planning to write a review, however, they placed a plate of them on our table afterwards to continue enjoying alongside our meal, which is what you see pictured above. I don't really like duck, or crostini, so the duck confit wasn't a winner for me, just an item I don't really care for on top of crispy and oily bread. Others enjoyed it. 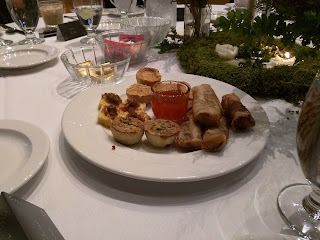 The vegetable spring rolls were good, a little oily, but far better than expected. They were served piping hot and fresh, quite rare for catering. How often is catered food actually hot? I did of course love the sweet chili sauce served alongside. The spanikopita quiche cups were the hands-down winner. They too were hot and fresh. The inside was cheesy and creamy, and the crust was flaky, buttery, and quite tasty. This was a unique form of spanikopita, no phyllo dough involved, but I really enjoyed these. Warm, cheesy, comfort food, how do you say no, particularly when they keep coming to you, delivered with a smile by very attentive serving staff. The staff did a great job here, circulating the entire room effectively (how frustrating is it when the platters of apps never make it more than a few feet into the room at large events?) and the food flowed steadily (again, how frustrating when it runs out after 10 minutes, or the lag between rounds is crazy long?). We wanted for nothing, and it was one of the most successful cocktail hours I've ever seen executed. 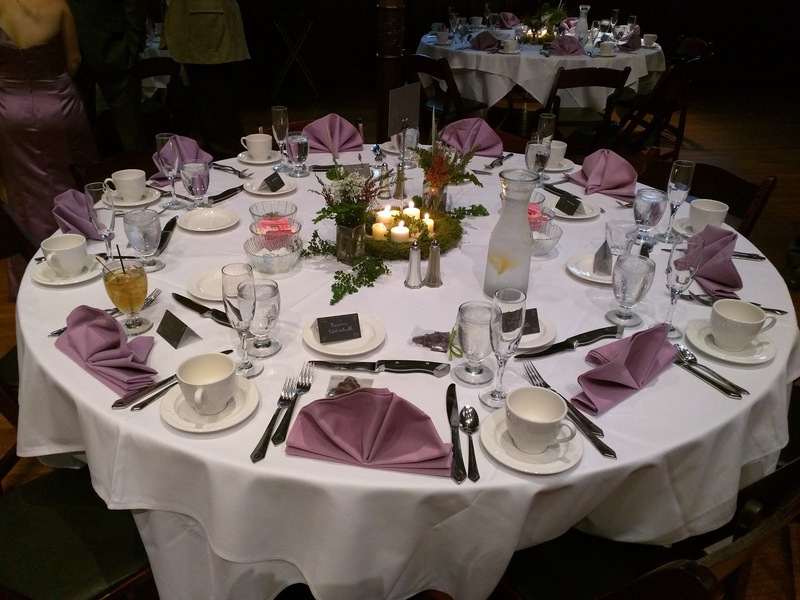 After the ceremony, we moved to seated tables for the main meal. 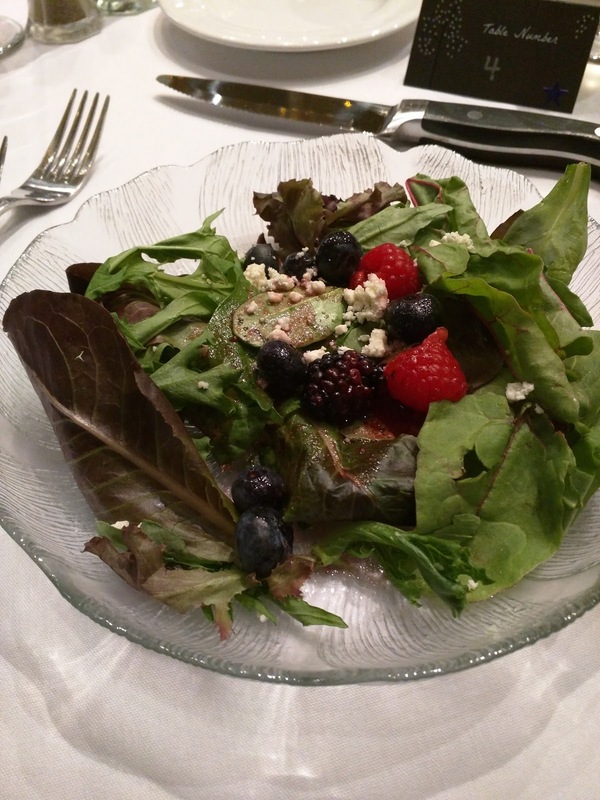 All dinner packages include salad, rolls, and coffee/tea service, in addition to the choice of 3 entrees. 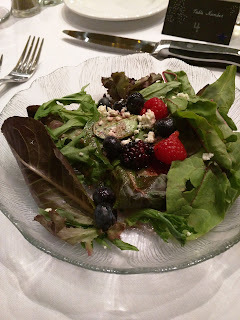 "Raspberries, blackberries, blueberries tossed with mesclun greens and topped with a berry vinaigrette and garnished with gorgonzola cheese". Our hosts had the choice of 5 salads for everyone to receive to start. I really applaud Exquisite Catering here, as not a single option was just a standard garden salad. The most run of the mill choices were the Caesar or Caprese, and the other three included more interesting ingredients like pears and candied walnuts, fennel and oranges, or, in our case, mixed berries. The salad was actually really quite good, almost awesome even (aside from looks, that is). The lettuce was fresh and crisp, and the spinach in particular really shone. The berries were all quite flavorful, fresh, and perfectly ripe, a great seasonal choice. Gorgonzola went nicely with the berries. But ... it was inconsistently dressed, and overdressed in places, and the dressing was just too powerful. The half of the salad I had without much dressing I actually really loved, but the center with all the dressing I couldn't quite handle. A shame, as the ingredients really were spectacular. Overall though, for mass wedding catering, the quality of the ingredients and freshness were very impressive. Moving into the entrees, our hosts were able to pick 3 selections for us to pick from in advance when we RSVPed. They selected one beef, one chicken, and one seafood option. For beef, they could select between the NY Strip or Filet Mignon, and luckily for us, they went for the filet. 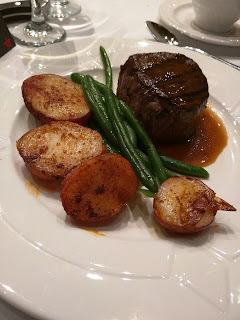 Ojan picked this for his entree, since of all items, steak is the one that catering tends to do the best, particularly because it is less temperature sensitive at serving time, and can hold its heat a little. I tried a bite and it was good. Obviously he had no choice in how it was cooked so it was more cooked through than we'd prefer, but it was decent quality, nicely seared, he polished it off without trouble, a bit remarkable given how much we'd already had to eat at this point. The beans were unremarkable, I really think just beans, not almandine as described on the catering menu. The potatoes were well roasted and seasoned, but not particularly interesting. Ojan didn't bother take a second bite, and left the potatoes and beans virtually untouched. But he enjoyed the steak, and was more than satisfied with his meal. Again, we had feasted on the passed apps, since they were so shockingly good, and we weren't expecting stellar entrees. "Topped with a crab and tomato butter along with herb risotto and asparagus." I opted for the seafood, even though I knew this was a risky move. But I really like fish! Our hosts had the choice of pecan crusted salmon with a honey beurre blanc, panko crusted roasted mahi mahi with a basil butter sauce, or this swordfish. They all actually sounded great to me. The swordfish was actually really quite nice. It was moist. Yes, seafood served en masse, and it wasn't dried out. It, like the apps, was piping hot. Not just warm, actually hot. A bit hard to see due to the sauce, but it had lovely grill marks on it, and a slight smoky flavor. I was stunned at how well the swordfish was prepared. 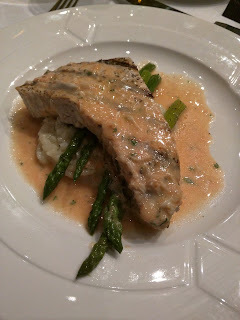 Under the swordfish was asparagus, also quite good, nicely roasted, fresh, seasonal, flavorful. No token generic frozen vegetables on the plate. All of this was atop a risotto. It too was quite good, flavorful, creamy, and nicely cooked. Not a pile of mush. And, the best part, the tomato butter with crab. This was truly delicious, and everything was smothered in it. It went well with everything on the plate. The portion was huge, and I'd already had quite a few of the appetizers, but I couldn't stop eating this. It wasn't just good for catering, it was just really, truly, delicious. I finished every last bite, even knowing how full I was, and that there was of course a dessert room to follow. Too good. Shocking. No one at our table opted for the chicken selection, so I don't have anything to say about that. After the meal, a back room was transformed into a dessert mecca. I believe the desserts were prepared by someone other than the main caterer, but I'm not positive. 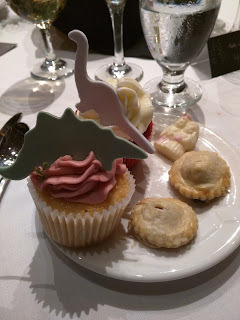 We had an assortment of cupcakes in fun flavor combinations, topped with fondant dinosaurs (the wedding theme). The cakes themselves weren't great, but the frosting flavors were all tasty, and I loved the cute dinos. There were also some lackluster mini pies and really excellent chocolates. This was all served with coffee and tea. The decaf coffee was very drinkable, a nice surprise. I don't even know how to write an intro for this one, so I'll just dive right in. Sprogs. What are Sprogs? 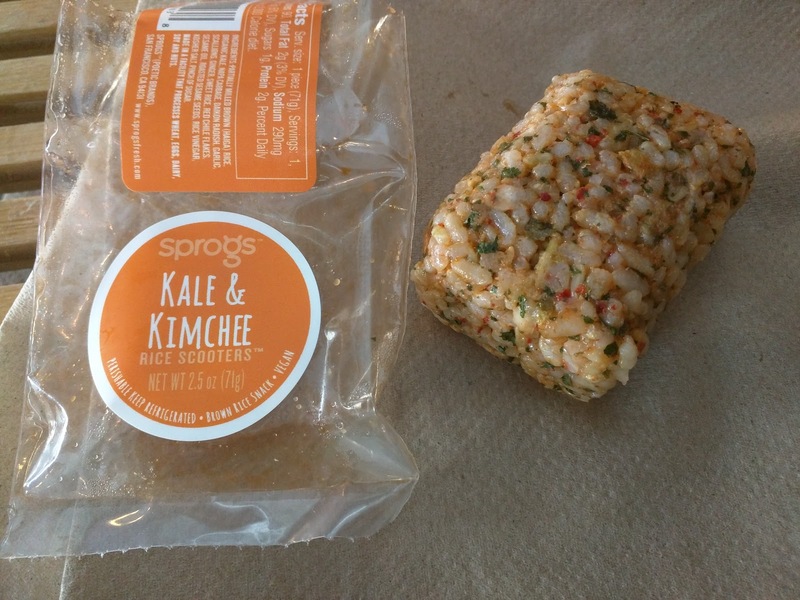 Well, according to the company, they are "Fresh Eats for Healthy Foodies On The Move!" I am frequently a "foodie on the move", but, uh, the "healthy" part is obviously debatable. But still, a new food item to try? Obviously I was in. 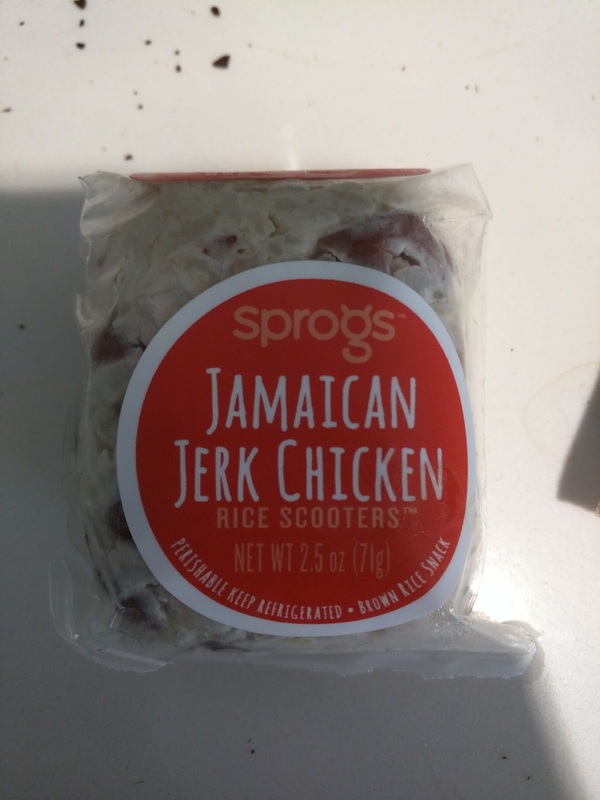 Sprogs are "Rice Scooters™". That cleared it up, right? They are balls made from rice mixed with other ingredients. Available in meat, vegetarian, and sweet varieties. All are small little balls, designed as a quick grab and go option for a snack or perhaps a light meal. Sorta like other forms of hand-held rice snacks like onigiri. The company, based in San Francisco, was started by a mother who cared about feeding her family healthy, fresh meals, and hated the available option for grab and go meals and snacks. So she set about creating a product that she'd be happy feeding her kids, and herself. All varieties of Sprogs use partially milled Haiga brown rice, made from rice grown here in California. Haiga rice is used because brown rice is more nutritious than white, and because the partial milling makes it easier to digest, without losing the nutritional benefits. Many of the ingredients (particularly meat, eggs, and dirty dozen produce) are organic. The corn is obviously non-GMO. All are wheat-free and gluten-free (although not certified), and most of the vegetarian options are also vegan. The company focuses on making the items as fresh as possible, making their own broth from scratch, their own jams (lower-sugar too), and pickling their own kimchee. No preservatives. Necessarily, these don't have a super long shelf life, less than a week, although they are fine left out of the fridge for a day, which is really handy. Designed to be eaten cold, since they are a grab and go item, but they note that some people prefer to heat them up. Sprogs sell for $2.59 each, which is a bit high for such a small treat, but makes sense given what goes into them. You can order via GoodEggs, or they deliver in SF and Palo Alto for a reasonable delivery fee of $4.99, or they can be shipped anywhere in the US for $28 ($18 for California). I tried many varieties, but alas, as I don't really like rice, these are certainly not the product for me. I still think my favorite rice balls are the onigiri in the JAL lounge in SFO. That said, Ojan, who does enjoy rice, and loves the rice balls from Onigilly, also didn't like any of these. He finds the rice too mushy. Meat eaters have 3 choices, two with chicken (teriyaki or Jamaican jerk) and one with bacon and egg. You can guess which one was interesting to me, given that I really dislike chicken, and, duh, bacon, when would I ever turn down bacon? Still, no winners in this category for me. "Our. Best. Seller. Coconut rice with red beans filled with shredded organic chicken that has been slow roasted in a hauntingly flavorful Jamaican Jerk marinade." But I started with the best seller: Jamaican Jerk Chicken. I was ready to hand it off to Ojan after I took my requisite bite, since I knew this wouldn't be one for me, as I don't like chicken or beans. Surprisingly, my favorite part was the rice. I liked the coconut rice, it used coconut milk rather than shredded coconut, so it was creamy and flavorful. Of course, this is why Ojan didn't like it, as the rice was too mushy for his taste. The beans were a bit mushy, but, they were beans. I don't like them ever. The chicken was in the middle, and I didn't try it. If you like chicken, I can imagine this being a nice bite, 110 calories each, so a nice little snack with some protein. Bacon & Egg "Fried Rice". 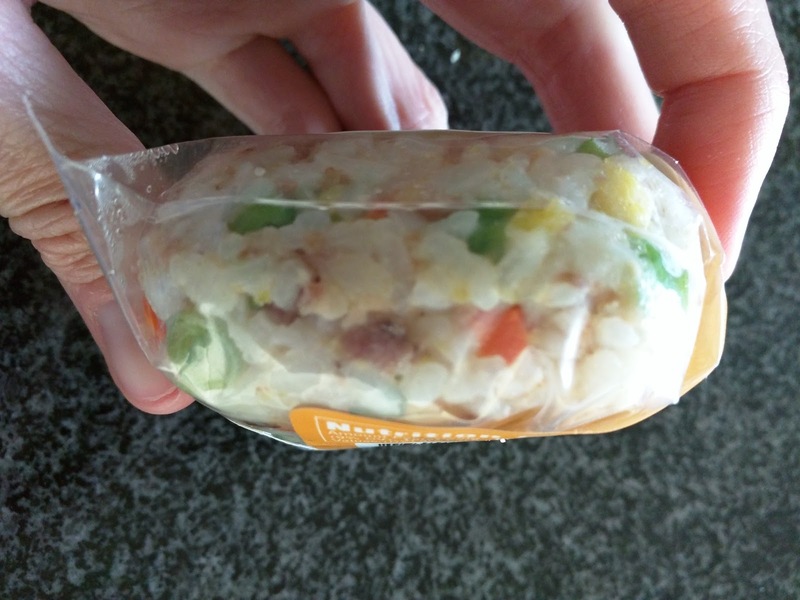 "The rice isn't actually fried, but it is chock full of chopped bacon, scrambled egg and veggies." Inside the ball was chopped cubes of carrots, peas, corn, and scallions. You could see the love that goes into these in how the sizes of all the vegetables were the same. They were well distributed throughout. The bacon chunks and egg chunks were also the same size. The brown rice was mixed with some sticky rice too, plus rice wine vinegar. 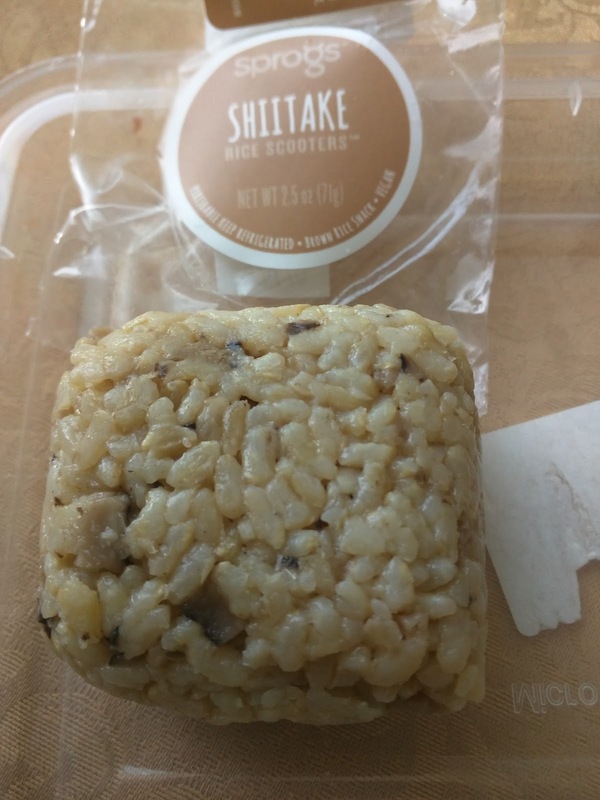 But ... it was still a rice ball. I just don't like rice, particularly brown rice. The veggies were well cooked, and I did enjoy the pops of flavor from the bacon, but, overall, this just wasn't for me. I added soy sauce which made it better, but, I'm not sure what it would take for me to really like a rice ball. The four vegetarian options are all also vegan, and I tried them all. Roasted Corn and Poblano (vegan). 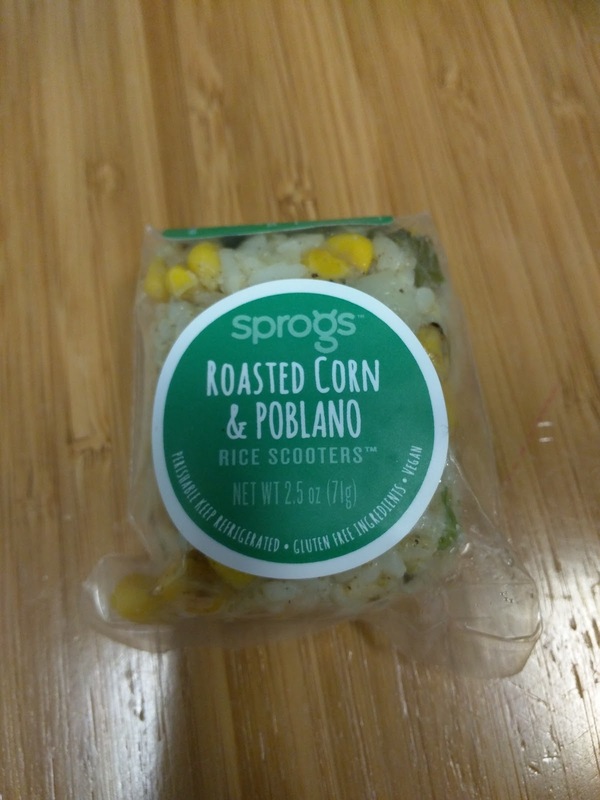 "Flame-roasted poblano peppers and toasted corn make for a surprisingly sweet, mellow flavor combination! Tied together with sautéed red onion, pureed organic Yukon Gold potatoes and a hint of ground cumin." This was actually a pretty simple flavor compared to others in terms of the length of the ingredient list. Besides the aforementioned poblanos, corn, red onion, and potatoes, there really was nothing else besides rice wine vinegar, salt, and cumin. It did have some good flavor, not due to the poblano as I expected, but actually from the roasted corn. It was super flavorful, fresh, and surprisingly crisp. I really liked the flavor of the corn. 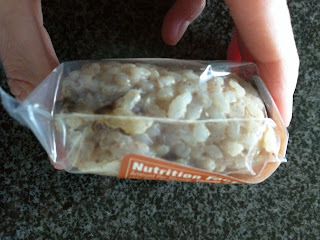 I also found cubes of potatoes inside, although the description said the potato was pureed. They were soft and tender, but very bland, since they were just potato. I still wanted a sauce or something, because even with the corn and poblanos, it was fairly plain tasting on its own. But with a good sauce, this could be a winner? "Bunches and bunches of fresh kale are finely chopped (turns our fingers green!). Then we carefully hand-chop our own home-made vegan kimchee for awesome flavor with a little crunch. (Instead of dried fish or shrimp, we achieve that funky, authentic kimchee flavor from fresh daikon.) "
I don't really like the flavor of kimchee, so, this was definitely not for me. I tried a bite, but, it was just a cube of mushy rice with a flavor I really, really didn't care for. "First we simmer a super flavorful shiitake broth and let it steep overnight to develop the flavors. Then we add Haiga rice and cook it directly in the shiitake broth. Fresh ginger adds a little extra background note to this vegan favorite." I did like the bits of shiitake in this one, nicely flavored with sake, mirin, and soy sauce. But they were tiny and there were not many. It was mostly just rice. I didn't pick up on the promised flavors in the rice from the cooking method, it was fairly plain. Not a big fan, well, since it was mostly just rice. With more mushroom, it has potential though. "A satisfying combination of red lentils and coconut milk simmered with onion and ginger. Toasted yellow split peas add extra texture and protein. Not exactly spicy but there is a little kick from the green chile. " I saved this for last, since I did not expect to like it. I dislike lentils even more than I dislike beans. Like the Jamaican Jerk Chicken the rice was cooked in coconut milk, so it was a different texture than the others. In this case though, it really just seemed like a pile of mush. I didn't care for it. I understand where Ojan was coming from in this aspect. I was confused when I saw the insides of this ball. I saw nothing red, instead there were little yellow things. 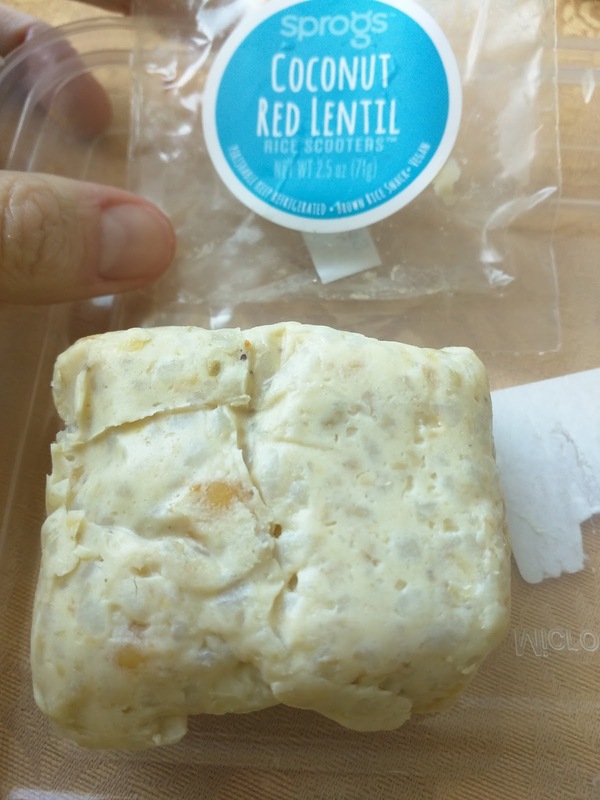 I thought this was red lentil? Hmm, maybe they subbed in other lentils? Then I tasted it. I tasted the unmistakable taste of split peas. I loath split peas, far more than beans and lentils. So then I read the ingredients list ... yes, those were yellow split peas. Blegh. And where were those lentils anyway? I never found any, nor did I pick up on the any green chile also mentioned. Hands down my least favorite. And finally, the category I was eying the most, the sweeter ones, all vegetarian. Two are plays on peanut butter and jelly, and the final, rice pudding. Yes, dessert! "A classic recipe made from Haiga rice simmered in organic milk with cinnamon and raisins. The only difference? You can eat this one without a spoon and we like it less sweet than traditional versions." To say that I was most looking forward to this one is an understatement. If I could pick only one Scooter to try, it was clearly going to be this one. As I've mentioned several times, I tend to dislike rice ... unless it is rice pudding. I adore rice pudding. I eagerly took my first bite. Cinnamon. So much cinnamon. Way too much cinnamon. Woah. I honestly can't imagine this is how they all are. I'd like to try another batch, as this was just so out of balance, it had to be a mistake. The rice is a mix of the haiga rice that all the Scooters use, plus some sweet white rice too. There is a little bit of milk and sugar in here to sweeten it, but it is still a ball of rice, so it isn't creamy like actual rice pudding. There were plenty of nice plump raisins. I didn't like this, partially because there was just way too much cinnamon, and partially because it just wasn't at all what I wanted it to be. A cold rice ball with rice pudding spicing is nothing like my precious bowl of creamy rice pudding. I tried to salvage it by adding milk, mixing it up, and heating it. I was trying to create a creamy, warm rice pudding, and trying to reduce the cinnamon overload. It still just wasn't for me. I'd like to try another to see if it too is crazy cinnamon-y?